Army Staff Sergeant Wallace Fanene was on his second deployment in September 2007 when he lost his right leg above the knee and his right arm below the elbow in an improvised explosive device (IED) blast in Kirkuk, Iraq. Airlifted to Balad, Wallace was still unconscious while in Landstuhl, Germany, waking to the sound of his wife’s voice three days later at Walter Reed Army Medical Center. As he looked at his wrapped limbs, he knew that his leg was gone, but did not realize he had lost his hand and lower right arm as well until he was told. Transferred to Balboa Naval Medical Center in San Diego, Wally was pleased to be nearer to his home and his family, spending a total of 18 months in hospitals before his release. A life-long surfer, SSG Fanene began surfing again post-injury as part of his therapies. He mentors other injured Veterans as well, making sure that anyone who wants to surf has the opportunity to do so. 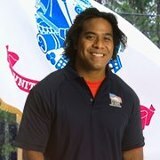 Wally enjoys Jiu Jitsu, weight training, running in marathons, snowboarding, and swimming. He most enjoys spending time with his wife, Scarlet and their young son and daughter. He says he is most thankful for the ability to carry on a somewhat “normal” lifestyle as a father and husband, celebrating every day he has on this earth.